If someone told you you’re not invisible would you cringe with embarrassment and look for the nearest hole to hide in, or sigh with relief? Much depends on what you want known or what you desire to hide. In this over-exposed world we live in, where every celebrity sneeze is recorded and all our achievements (and the lack thereof) are public property, it’s hard to melt into the margins unless we work at being separate and seek ways to come apart from the crowd. Although, from time to time all of us can feel like ghost-shadows passing in the street as we hover around with no discernible sign of our presence being found. Social media works fine if you want to be sociable, although it’s possible to feel more isolated than ever as we get snared in the comparison trap, checking our lifestyles with one another and seeing how we fall short of the perceived ideal. Healthy interest can soon become snide comparison, envy and jealousy. And many feel invisible, lost and alone with their shame, pain, illness and distress. They don’t desire to be ignored, yet often are. Society has a way of stigmatising and labelling people which fails to take into account their unique human perspective, struggles and challenges. But they are human beings just like you and me – made in God’s image, precious and beloved in His sight. They actually want nothing more than the right kind of attention:understanding and appreciation, a friendly listening ear, consideration, thoughtful and loving care. God sees, hears, witnesses all we go through, all we are and all we’re in the process of becoming. He knows our life’s end from its beginning. He extends grace and mercy toward all, especially the down-trodden, disabled, despised, destitute, discouraged and depressed. And that’s good news, isn’t it? It’s gospel news – liberating, life-changing and transforming. Each moment is an opportunity to begin again. Every day is a fresh breathing space of grace. Our situations may remain the same; life may be a tremendous struggle just to keep head above water – and we still have this to cling to. 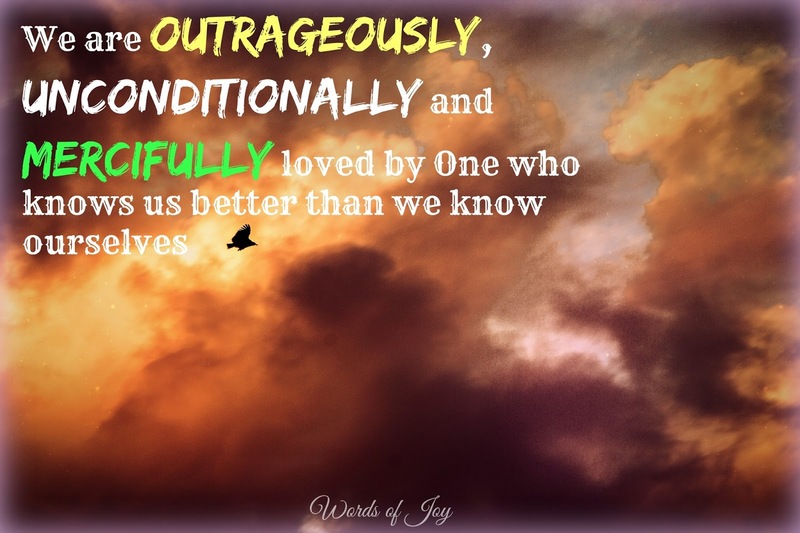 We are outrageously, unconditionally and mercifully loved by One who knows us better than we know ourselves, whose Spirit lives and breathes within, whose mantle of righteousness covers every stain of sin, guilt and shame. My friend, you are not invisible to Him. Every hair on your head is counted. He doesn’t miss a thing about you. I’ve clung to these truths in my daily battle with M.E and chronic illness, living a life overshadowed by childhood abuse and its repercussions, experiencing profound physical weakness, pain and fatigue. I’m aware that many misunderstand my illness, fail to see how writing a blog post may be the only active thing I can do in a day and how a simple task like taking a shower can leave me pole-axed for hours. They may also shrink away from the painful personal things I’ve shared and fail to see how God equips and inspires my words to help others feel less alone with their own struggles. Because we’re all too quick to judge one another rather than stepping inside their shoes with eyes of empathy and compassion, aren’t we? I’m not exempt. Insecurity can make me cling to what’s familiar and shy away from different. What if we tried to see others as God sees them? To listen closely without interruption or planning what we’re going to say next. To offer time and attention. To withhold from judgement and criticism. To offer grace, forgiveness and mercy. To pray for them and with them. To recognise that we’re all in a battle and other people are not the real enemy. To lean heavy on grace and lightly on guilt-tripping. To be the voice, the hands and feet of Jesus in this world. Maybe… just maybe… we will offer His visibility and help them see how He sees them too. It’s worth a try, yes? And as we do so we will find how deep down, at soul level, we are more alike than we knew. Beautiful and important post, Joy. Thank you. Beautifully said, Joy. Longing with you to "To be the voice, the hands and feet of Jesus in this world." I'm so sorry you have to deal with so much, but God is using your pain for a purpose. To reach the invisible ones and give them hope in Jesus. Hugs!